Raosaheb Ramrao Patil, better known as R. R. Patil, (Marathi: रावसाहेब रामराव पाटील) (16 August 1957 – 16 February 2015) was an Indian politician from the state of Maharashtra. He was an important leader of modern Maharashtra. He was a member of the Nationalist Congress Party. He became Home Minister of Maharashtra for the second time after the 2009 Maharashtra assembly election victory of the Congress-NCP alliance. He was also the former Deputy Chief Minister of Maharashtra. R. R. Patil, popularly known as “Aaba”, (Marathi :आबा) was born on 16 August 1957 in the village of Anjani, in the Tasgaon taluka, Sangli district in the State of Maharashtra. Despite his father being the village head, their financial condition was not good. He completed most of his education under the government scheme of "Earn & Learn". He obtained a B.A. and an LL.B. from Shantiniketan college in Sangli. Patil was a member of Sangli Zillah Parishad from 1979 to 1990 from Savlaj constituency, then was elected to the Maharashtra Legislative Assembly in 1990, 1995, 1999, 2004, 2009 and 2014 representing Tasgaon, in Sangli district. He became the Chief Whip of the Congress Party in the assembly as well as the chairman of the public accounts committee of the assembly in 1996–97 and 1998–99. On November 1, 2004, he was sworn in as the Deputy Chief Minister of Maharashtra. He was the chief of the Nationalist Congress Party's Maharashtra unit and NCP legislative party in Maharashtra. He was also the Home Minister of Maharashtra in the previous government. After taking charge of Home Ministry, he also sought guardianship of Naxal Activity affected district Gadchiroli. Since then, in spite of many naxalized attacks he encouraged natives to support elected Government through some developmental work for them. He was the most respected politician in Maharashtra, also christened as 'Mr Clean' in political circles due to his clean image in the erstwhile tainted political party and also due to cleanliness awareness initiatives like “Gadage Baba Swachata Abhiyan” & “Tantamukt Gaon”. His comments in the aftermath of the November 2008 Mumbai attacks have drawn severe criticism for downplaying the gravity of the situation. He was quoted as saying, "They (the terrorists) came to kill 5,000 people but we ensured minimal damage". [This quote needs a citation] Sources close to him[who?] have argued that his comments are being taken out of context and that he did not intend to downplay the grievous attack. He resigned on 1 December 2008 after further remarks on the attacks. When asked at a press conference whether the terror strike was an intelligence failure Patil said, "It is not like that. In big cities like this, small incidents do happen. It's [sic] is not a total failure." Patil's words drew flak from many quarters. Mumbai residents who saw him say this on television or were told about it by reporters pointed out the irony of politicians making such statements after being provided high security. Patil died at Lilavati Hospital and Research Centre after a long fight with oral cancer. Patil showed signs of improvement after his initial treatment and was taken off life support in January 2015, but he succumbed to the disease on 16 February 2015. The last rites were performed in Anjani village in Tasgaon area of Sangli district, Maharashtra on 17 February 2015. Patil's funeral was held with state honours, including a 21-gun salute by the Maharashtra government and was attended by the Maharashtra Chief Minister Devendra Fadnavis, Anna Hazare, Sharad Pawar and other political leaders from various parties. ^ "R R Patil: 'Mr Clean'". Rediff.com. 12 November 2004. Retrieved 18 July 2018. 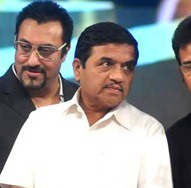 ^ "In R R Patil, Maharashtra loses a politician with solid rural roots". The Economic Times. 16 February 2015. Retrieved 18 July 2018. ^ "Deshmukh quits, no decision on successor yet". Merinews. 1 December 2008. Retrieved 18 July 2018. ^ "RR Patil has a language problem, calls attack small". News18 India. 29 November 2008. Retrieved 18 July 2018. ^ Damini Berry (2 December 2008). "Minister paid dearly for the 'small incident' remark". Merinews. Retrieved 18 July 2018. ^ "A year after 26/11,R R Patil is back as Home Minister". The Indian Express. 9 November 2009. Retrieved 18 July 2018. ^ "Senior NCP leader R R Patil is no more". Yahoo India. 6 February 2015. Retrieved 18 July 2018. ^ "Maharashtra's former home minister and NCP leader RR Patil dies in Mumbai". IBN Live. News18 India. CNN. 16 February 2015. Retrieved 18 July 2018. ^ "RR Patil's last rites to be performed in his village Anjani at 1pm today". ABP News. 17 February 2015. Retrieved 18 July 2018. ^ "Tearful farewell to R.R. Patil". Deccan Herald. Sangli, Maharashtra. 17 February 2015. Retrieved 18 July 2018. Wikimedia Commons has media related to R. R. Patil. This page was last edited on 23 March 2019, at 11:38 (UTC).